← Audiomodern release their first audio plug-in, “Riffer” ! With Nomad Factory’s E RetroVox is designed to add a wide range of vocal effects to any studio toolkit. The included Vinylizer generates the warm sound and drive of old vinyl records. From today is on sale at $19, a saving of $40 off the $59 list price! With the E RetroVox you can even add the vinyl pops and clicks, and at various speeds like 33 rpm or 78 rpm. Other features of the RetroVox include Noise Gate, Compressor, Bass and Treble controls, Brick-Wall Limiter, and V-Mix which blends the output of the Vinylizer with the non-Vinylized signal of the RetroVox. 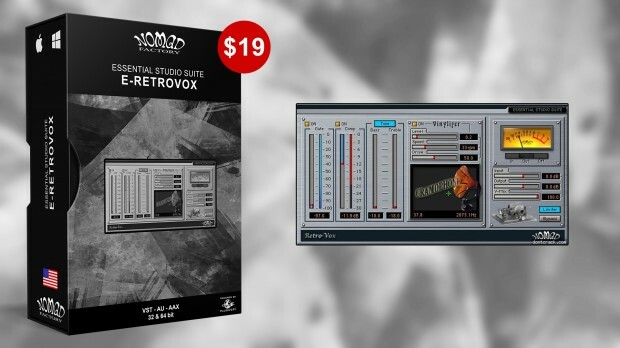 The Retro-Vox by Nomad Factory provides amazing effects and processing functions for use specifically on vocal tracks. In addition to a Gate and Compressor, this plug-in offers Tone controls and hi/lo pass filters to create a wide range of vocal effects, such as Gramophone, tape simulation or the mid-range phone voice. This entry was posted in DontCrack, Plug-ins, Promotions and tagged brick wall limiter, Compressor, E RetroVox, noise gate, Nomad Factory, tape simulation, vinyl clicks, vinyl record sound, Vinylizer, vocal effects. Bookmark the permalink.